Rough Riders is a high adventure summer camp experience at El Rancho Cima. Venturers and adults will experience zip lining, a horseback trek, whitewater adventure, rock climbing, rappelling and much more. Scouts and Scouters can sign up individually. Weekend Camping is available for crews at Camp Brosig, Bovay Scout Ranch and El Rancho Cima. The Getaway at Cima is a program available for crews who are camping at El Rancho Cima. 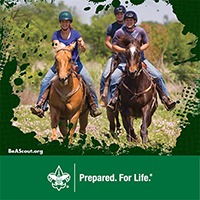 Venturers can shoot rifle and shotgun, ride the horses, or zip down the longest zip line in Texas.